Click New to create a new menu item or click on an existing item to edit. Click the Menu Item Type Select button and then click the List Web Links in a Category link under Weblinks. To edit an existing Weblink Category Item, click its Title in Menu Manager: Menu Items. Used to show a list of Web Links in a Category. Categories are shown in a hierarchical list, parent with child (sub) categories. Depending on the selected layout options, click on a category Title to show the Web Links in that category or sub categories. This layout requires a category selection. This is done in the list box shown above in the screenshot. All child categories of the selected category will show in the layout if sub categories are shown. Choose a category. Select one Category from the list box. Category Title. (Use Global/Hide/Show) Whether to hide or show the title of the category. Category Description. (Use Global/Hide/Show) Description of this category, which can optionally be displayed in the front-end. Category Image. (Use Global/Hide/Show) Whether to hide or show the category image. Subcategory Levels. 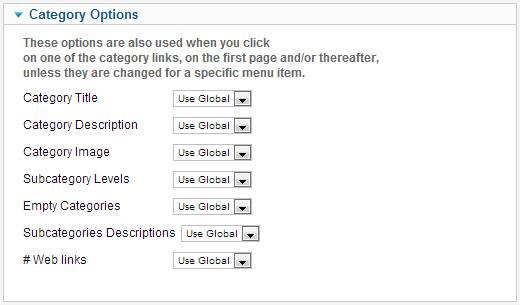 (Use Global/All/1-5) The number of levels of subcategories to show in the layout. Select All to show all levels in the subcategory hierarchy. Empty Categories. (Use Global/Hide/Show) Whether to hide or show the categories that contain no content items or subcategories. Subcategories Descriptions. (Use Global/Hide/Show) Whether to hide or show the category description of subcategories. # Weblinks in Category. (Use Global/Hide/Show) Whether to hide or show the count of weblinks in each category. Display #. (Use Global/Hide/Show) Whether to hide or show the Display # control that allows the user to select the number of items to show in the list. An example is shown below. Table Headings. (Use Global/Hide/Show) Table Headings show a heading above the article list, as shown below. If set to Show, this heading will show about the list. Otherwise the list will show with no headings. Links Description. (Use Global/Hide/Show) Show or Hide the description of the weblink. Pagination. Hide or Show Pagination support. Pagination provides page links at the bottom of the page that allow the User to navigate to additional pages. These are needed if the Articles will not fit on one page. An example is shown below. The Weblink Category layout has the following Integration Options. These determine whether a news feed will be available for the page and what information it will show. Show Feed Link. (Use Global/Hide/Show) Whether to Hide or Show a link to a news feed (RSS Feed). If set to Show, a Feed Link will show up as a feed icon in the address bar of most modern browsers). See Menu Item Manager: New Menu Item for help on fields common to all Menu Item types, including Details, Link Type Options, Page Display Options, Metadata Options, and Module Assignments for this Menu Item. Cancel/Close. Closes the current screen and returns to the previous screen without saving any modifications you may have made. 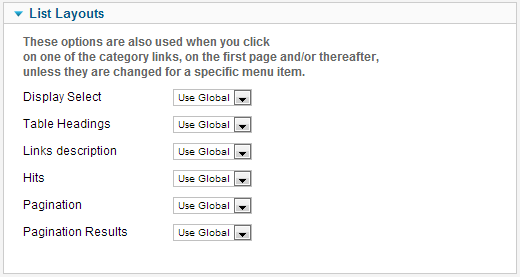 In Web Links Manager Options you can set the default value for all categories. In Category Manager: Edit A Web Links Category you can set a value for a specific category. If this is set, it overrides the default value. Categories are created using Category Manager: Edit A Web Links Category. This page was last modified on 21 March 2013, at 15:12.